Dr. Swarup China of Pacific Northwest National Lab will present "The Role of Biological Particles in the Atmosphere". Abstract: Airborne biological aerosols are an integral part of the atmosphere-biosphere interface and significantly impact the environment and Earth’s climate. Primary biological aerosol particles such as fungal spores, bacteria, and fragments of plant debris, are emitted directly from the biosphere into the atmosphere. Biological particles are composed of different materials with diverse physical and chemical properties. Biological particles undergo atmospheric aging processes that further alter their complex composition. A combination of X-ray micro-spectroscopy and high resolution mass spectrometry techniques can provide a comprehensive arsenal of tools for improving our understanding of the nature of these particles at the biosphere-atmosphere interfaces and their reactivity and transformations during atmospheric aging. I will discuss recent findings such as rupturing of biological spores as a source of secondary particles in Amazon rain forest; phase state/viscosity of subpollen particle after rain events and their impacts on climate. 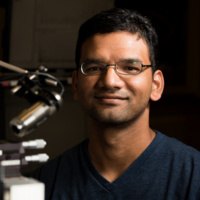 Bio: Swarup completed his Ph.D. in Atmospheric Sciences at the Michigan Technological University in 2014. Then he joined Environmental Molecular Sciences Laboratory at Pacific Northwest National Laboratory as a postdoctoral research associate, to study chemical aging of atmospheric particle through multi-phase atmospheric chemistry and to investigate the effect of physiochemical properties of atmospheric particles on heterogeneous ice nucleation. Currently, he is a senior research scientist at PNNL. His major areas of research interest are the morphological and optical properties of atmospheric aerosols, atmospheric aerosol chemistry and heterogeneous ice nucleation. He aims to better understand the physical chemistry of atmospheric particles controlling aerosol-cloud interactions.